Speaking of hibernating insects, last night when I went to brush my teeth I discovered this little guy on the wall. The last time I saw a moth was probably back in November; generally speaking they’re not the sort of bug you expect to be out and about in mid-winter. So I was a little surprised to see it. I took some photos but otherwise left it alone. It was gone by the next morning. 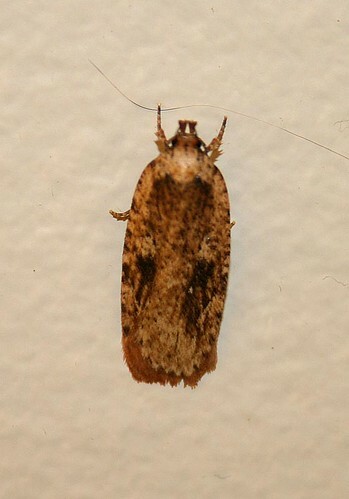 I’m relatively new into moths as a group, but I’m fairly certain this one is Agonopterix pulvipennella. Moths are the sort of creatures where they’re either so obviously distinct it’s hard to mix them up with something (for example, a Luna Moth), or so similar to six other species that you really wonder just what criteria was being used in calling them unique. This one falls into the latter category. The key here is the dark spot on the wings, with a little white spot at the bottom, and a broad pale arch that crosses the shoulders and joins the two dark spots. But it takes a bit of scrutiny to identify, and it still looks like a bunch of other Agonopterix species. A. pulvipennella, it turns out, doesn’t die with the cold weather, like many insects do, but rather overwinters as an adult, and then comes out to breed in the spring. Like the ladybugs and wasps, it will often choose cracks in the walls of your house to crawl into to settle down for the winter. When the weather warms up a little, they can end up in your house. What was funny about this one is that yesterday it was rather nippy out (not helped by the gale-force winds), so I guess it’d come out the day before (when it was nice and mild) and had been hanging around, unseen. It seems to be a relatively common and widespread species, found throughout much of northeastern North America. The larvae feed on the leaves of goldenrod and nettle during the summer. They pupate in late summer, and adults emerge starting in August. Although the moths are about throughout the fall and into the spring, they’re apparently most commonly seen in the spring, which seems sort of funny to me. Perhaps because, to a moth, UV wavelengths mimic the pheromones of a female, they’re more likely to be attracted to lights, where we can see them, in the spring when looking for a mate? I’ve seen moths against the window outside, just last week–the warmth of a mid january day stirred her, i guess.